The lack of adequate and secure access to land and natural resources for the rural and urban poor is one of the key causes of hunger and poverty in the world. Land grabbing further exacerbates the highly unequal distribution of land ownership, thereby impacting the enjoyment of the human rights of the local population, particularly their right to adequate food. Land grabbing is merely one expression of a broader process of commodification and financialisation of food, land, water, seeds and nature. 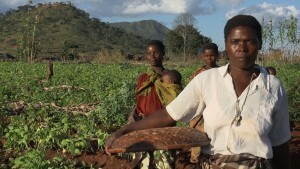 Factsheet: Why do we need a Declaration on the Rights of Peasants? How did a Dutch bank come to own land from Romanian farmers that were not even aware their land had been sold, or did not consent selling it? An alliance of 16 European organisations, including peasant movements, environmental, and human rights groups presented today ‘Hands on the Land for Food Sovereignty’. Under the watchful eye of corporations, the ‘cultural legacy’ of the EXPO 2015 ignores international human rights law and the right to adequate food and nutrition.